"We're searching the world right now for better methods, low carbon methods, to create energy," says Thomas Missimer, of Florida Gulf Coast University. "We want electricity that's generated at base load—in other words, generated 24 hours a day without interruption. Geothermal is one of those types of energies." Dry rock geothermal methods are currently being used in parts of the world for energy production, but Missimer says that the heat can be used in more efficient ways, especially with desalination. Details of the new research constructing a "geothermal energy-water campus" will be presented on Monday at the 2018 Geological Society of America Annual Meeting in Indianapolis, Indiana. Usually, geothermally heated water from the ground is converted to steam, that steam powers a turbine to create electricity, then the heated water is vented to the atmosphere while it's still hot—still over 100 degrees Celcius in most cases. Instead of venting, the team wants to use that hot steam in their desalination processes. The first desalination process is multiple effect distillation (MED), which requires hot water (above 100 degrees Celsius), but the second process, adsorption desalination (AD), can be run on cooler water, says Missimer. As the steam moves through the system and cools, it is still effective for powering desalination. 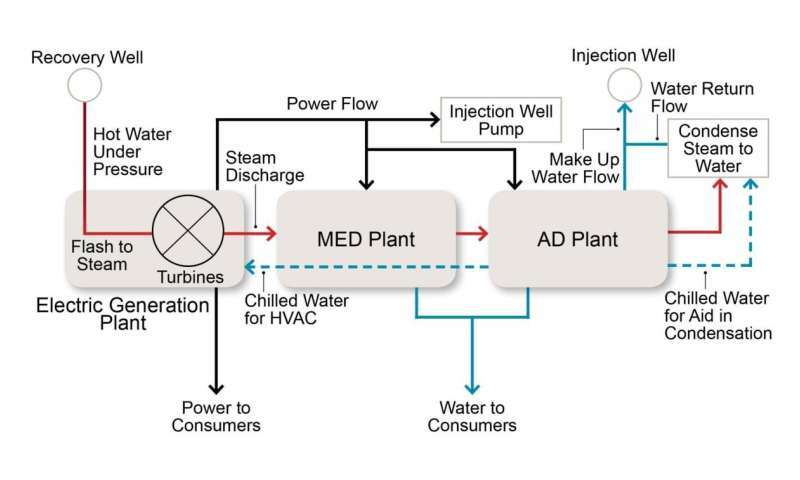 "Now you have an efficient system where you have conserved the latent heat that you've captured in the ground through three processes: turbine electricity generation, MED and AD." Lastly, the researchers propose to store excess water in aquifers for later use, which Missimer says is a future energy saver. "By storing some of that excess water, you can use that water seasonally when more water is required and sort of even out the changes in demand to the system." The benefits of a system like this are broad: there is no carbon dioxide being produced at the plant, as it is all self-contained and powered by geothermal energy, rather than fossil fuels. It also has an economic benefit. "If you look at the benefit to the place like Saudi Arabia, saving 6 million barrels of oil a day, at $100 a barrel—that's a bloody fortune," says Missimer. Missimer says it is even more effective than a solar-powered plant, because it can be run 24 hours a day, compared to just daylight hours. He adds that the benefits really come with the efficiency of operation. "In a facility like this, if it's run properly, you're not consuming a resource," says Missimer, adding that the heat keeps flowing and is renewable. For now, the idea is theoretical and hasn't been put into practice. But Missimer adds that the individual parts of the plant and the technology have been around for a while—it just hasn't been combined all together into one plant. "We've learned that sometimes you don't need new technology to make advances," he says. "Sometimes it's piecing together old technology in a constructive way to provide more efficient operation." He and his colleagues are hoping to put their carbon-neutral desalination ideas into practice in the near future.